After spending some time looking at the Yagyu tsuba, I thought it was only fair to take a similar look at the tsuba that Miyamoto Musashi made. When I say made, although it is by no means certain to what extent he was actualy involved in their manufacture, his skills as an artist are not in doubt, so it is likely that he was more involved in the work than Yagyu Renyasai; I imagine he actually drew out the designs at some stage and, as we know he had skill as a wood-carver, may even have made maquettes (wooden models) and quite likely worked the metal himself. It is also fairly likely that, when he lived as a guest of the Hosokawa family in his later years, that he would have been able to work with skilled artisans in the same way that Renyasai did. There are two designs that have come down to us that are normally credited to Musashi. The first might, more properly, be regarded as his version of an already existing design. This is his namako or sea cucumber/sea slug design. 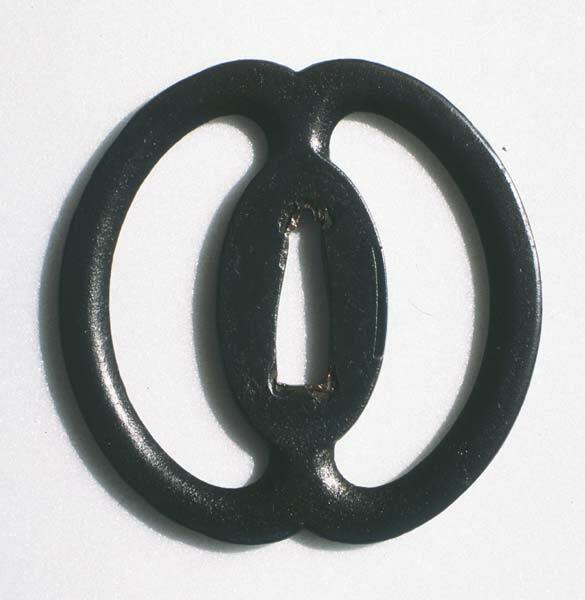 Several different versions of this exist, differing only slightly, that were made by him or under supervision, but as anyone who has ever googled 'Musashi' and 'tsuba' will know, it is extremely popular as a design for replica swords, both on account of its connection with Musashi and its elegant simplicity (and thus ease of reproduction). Although the term namako is used independently to refer to this vaguely slug-shaped design in a variety of contexts, I think Musashi may have been purposely referencing the sea cucumber, given that his other tsuba design, the namazu and hyotan (catfish and gourd) is strongly linked to the same principle characteristic - slipperiness. The saying 'hyotan de namako wo osaeru' (to hold down a catfish with a gourd) has two closely related meanings - one denotes the impossibility of an endeavor, while the other is somewhat similar to 'as slippery as an eel'. The theme has a long connection with Zen, starting, as far as anyone has been able to reliably ascertain, with a painting by Josetsu, Hyonenzu, which is usually translated as 'Catching a catfish with a gourd'. The theme was suggested by the shogun Ashikaga Yoshimochi, and above the painting itself are 31 poems brushed by important Zen monks commenting on the difficulty or non-sensical nature of the task. Since then, the theme has been used as an illustration of the difficulty of attaining enlightenment through rational means. As Dave Lowry noted in an old column in Black Belt magazine, the solution is to leave the gourd and allow the curious catfish to find its own way in. However, if we are using the image in the sense of pinning down the catfish, it is the slippery nature of both the gourd and the fish that are important. 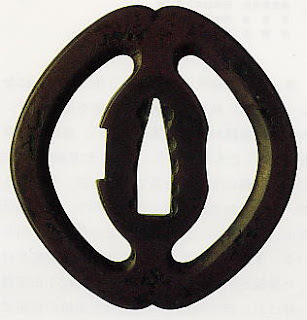 The fact that Musashi used the theme of slipperiness on two tsuba designs seems to point to an important aspect of his swordsmanship. The gourd itself had a very similar role as a symbol in the teachings of the Kashima Shinryu, and presumeably also in Yagyu swordsmanship, (there are references to it in poems by Yagyu Sekishusai and in the tsuba designs of Renyasai) relating to the difficulty of pressing down a buoyant gourd underwater. This image almost exactly parallels that of the catfish and the gourd - once you think you have it, it has wriggled out from underneath your sword. I believe this refers to the sensitivity necessary in pressing down an opponent's blade, as well as the irrepressible fluidity the swordsman sought to develop himself. 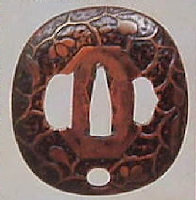 As well as the tsuba he designed, Musashi used a variety of tsuba on his own swords - although one portrait does appear to show the namako tsuba on his sword, the well-known self-portrait does not. 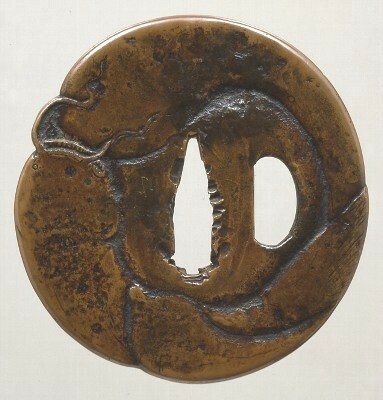 I haven't visited the Shimada Art Museum in Kumamoto, but believe there is a tsuba with a cherry blossom design which is said to have been owned by Musashi. I can find no hard information on it, but I believe it may be this one, which is owned by the museum, and is certainly very beautiful. Intriguingly, the bridge over the Miyamotogawa in the village of Ohara, which claims to be the birth-place of Musashi, and has done its best to lure the tourists hither, displays both a cherry blossom tsuba design and the common namako design. Whether this was a whim of the artist or based on some hard facts, I have no idea. Quick edit... 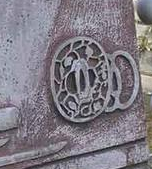 I was looking at the design as a sukashi tsuba...with the dark bits cut out...of course it is actually the design in the photo above - I just didn't realise it until now. I was going to write something about Musashi koshirae, but I think that will have to wait for next time or I'll never get this up! Very interesting information. Thank you. The saying 'hyotan de namako wo osaeru' (to hold down a catfish with a gourd) has . . . Thanks, Robin. I would have replied earlier, but I have been away from regular online access for the past 6 weeks or so. I hadn't noticed that slip of the keyboard (obviously) - I don't think I'd like to try holding down namako with anything, unless it was a couple of swigs of good quality sake. Including some rare texts you won't find anywhere else. The title of this blog, Ichijoji, refers to the site of the battle between Miyamoto Musashi and the massed forces of the Yoshioka clan. It was also, as it happens, not more than ten minutes away from where I used to live, on the eastern edge of Kyoto. It is, for me, powerfully redolent of the mystery and romance of Japan. 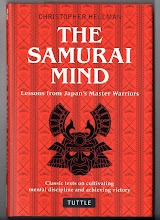 Musashi himself is an emblematic figure, and his skill in a range of arts to which I have devoted years of study myself -swordsmanship, strategy and sumi-e, make it an apt title for this blog.